Introduction to Star Wars Worlds 2017 » The Shadow Archive - Analyzing and Creating some of Fantasy Flight Games' Living Card Games. Focuses on Star Wars, Lord of the Rings, and Call of Cthulhu/Arkham Horror. It’s May the Fourth, so you know what that means: the Star Wars World Champio… yeah, I wouldn’t be surprised if you were feeling a little thrown off too. After all, last year’s World Championship was only six months ago, and the National and North American Championships are occurring after Worlds this year. But this is merely the transition pains of adding another full weekend of tournaments to the Fantasy Flight Games schedule. While future Worlds will have a full year to develop, this event is interesting because of its curious proximity to the previous event, and what little has actually changed in those six months. The Oppositions Cycle may have completed between last November and now, but that actually only comprises of four Force Packs (as Ahsoka and Zeb had already come out before last November). May the Force Be With You has shown that even a single objective set can radically redefine the shape of the competitive metagame, but how much has really changed since 2016? The most striking thing about the results from the Worlds 2016 Top Cut on the dark side is that they were pretty diverse. Navy was overwhelmingly represented, both due to its longstanding success in the 2 years previous and because it’s a fairly straightforward deck to play. But it was still less than half of the top cut, being forced to share the spotlight with Sith decks (either Mains-style mono-Sith or Force Hunters) and with the green underdog that was Scum. Anecdotal evidence from the tournament last year would produce the sense that any dark side faction was viable, often with multiple takes on the same affiliation. The group-think that all affiliations were good helped contribute to many people abandoning Navy for the powerful new options available in Scum (Dengar did a lot there) and experimenting in new Sith spaces: the Terentateks and Sith Wyrms were then beginning to show themselves. In looking back at the decks from November, there are a few important ones that stand out. Because so few cards have come out in the last 6 months, it’s important to be ready to see them again across the table. The most popular, and most controversial, of the Worlds 2016 decks is of course Navy Fortress. This deck revolves around the Imperial Entanglements trio of The Tarkin Doctrine, Enforced Loyalty, and Might of the Empire to prolong the game and make it exceptionally difficult for your opponent to actually destroy three objectives. These three pods are generally supported by objective sets such as Endor Entrapment (good defenders), The Last Grand Admiral (an excellent main), Imperial Blockade (a brutal starting objective), Entrenched Defense (more ways to protect your key objectives), and Moon Blockade (event cancel). With some of the best objectives in the game, Navy Fortress is all about starting out strong and never giving your opponent a chance to catch up. By using objectives like The Tarkin Doctrine and Entrenched Defense, the deck can slow down your opponent’s ability to attack critical objectives, while Might of the Empire and Endor Entrapment keep your Capital Ship defenders in the fight. 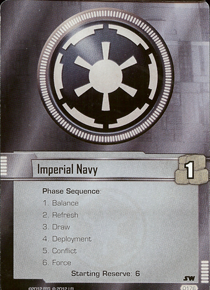 With ample ways to disrupt and defend against attacks, the use of Enforced Loyalty and Imperial Blockade allows the Navy deck to incrementally whittle away at the opponent’s objectives without attacking (and losing units or edge cards) so that by the time the light side player has stabilized and can attempt to go after the Navy objectives, the game is already over. When your best units are Gladiator-class Star Destroyers, Grand Admiral Thrawn, and the Chimaera, it’s easy to see why this is a passive, reactive deck that seeks to hold onto the upper hand rather than gain an upper hand over the opponent. Its biggest weakness has always been explosive effects such as those found in Owen’s pod (A Hero’s Beginning) as in a game of incremental effects, the Navy deck will always outpace their opponent. When Imperial Entanglements came out, the leap in power that the Imperial Navy received put it head and shoulders above everything else that it had to compete with. Even backed up by Scum’s cheap tactics as in 2014, the Sith couldn’t hope to keep up with the arms race that the Navy and Jedi were engaged in. Then Galactic Ambitions released, and two important additions were made to the card pool. The first was Dark Lord of the Sith. Seeing how effective the oppressive Navy objectives had been, Vader decided he wanted some of that glory and arrived with an objective just as demoralizing as The Tarkin Doctrine. When your opponent’s smallest (non-Vehicle) unit is taken out of the game for free every turn, they can no longer just play Luke to an empty board and wreck you with him. This made opening plays even more critical for the light side, as they needed to be prepared to open with support chuds rather than mains. With the Sith now capable of buying an early turn to set up, their options were opened and it became viable to rely on powerful but less consistent objective sets like The Emperor’s Web and Encounter at Stygeon Prime. However, Vader’s set is not without its faults. While Dark Lord of the Sith creates a brutal turn-one situation for the opponent, it does little to disrupt them once a support chud has been set aside to fulfill Vader’s objective. Telekinetic Strike and Visage of the Dark Lord, while very powerful combat tricks, only work when backed up by powerful units (and in the case of Telekinetic Strike, require you to use that unit in the first place). The Sith Warrior is useful but two guns isn’t good enough on defense when up against Yoda, Luke, and the Falcon, while Vader’s 5 cost can be problematic when he can only ever stop a single unit (assuming that unit has no protection). All this adds up to an objective set that starts out powerfully but unless backed up by copious removal (usually Lightning, Deadly sight, and Force Storm) it can be beaten fairly consistently. Still, the Sith have been powerful since the game’s inception and Dark Lord of the Sith only brought them back up to par alongside the other affiliations. Interestingly, however, the fact that Dark Lord of the Sith requires three Sith objectives produced some interesting deckbuilding choices: while there was a single truly mono-Sith deck in the Top 16 (powered by the cheap tactics of Tuk’atas), the most popular strategy was to run 9 Sith pods and a single choice pod (usually Navy) from a splash affiliation. Sith have been splashing resources or tactics icons into their decks for a while, but when they need to guarantee three Sith objectives there’s only space for one out-of-faction objective. You’d think most players would simply stick to the consistency of a single affiliation, but it looks like even one Moment of Triumph or Grand Admiral Thrawn is enough to greatly improve the otherwise traditional Sith deck. The deck’s contents tends to be fairly straightforward: Dark Lord of the Sith and The Emperor’s Web form the foundation of the deck, being the two best objective sets in the affiliation, with almost any other six objective sets used to round out the strategy. Popular choices include: The Plan of the Prophetess (resources and removal), Agent of the Emperor (Mara Jade), Encounter at Stygeon Prime (Inquisitor), Hunters of the Jedi (good units), Merciless Plans (Sith Lightsaber), Brothers of the Jedi (good units), The Executor Arrives (Sith Holocron), and even Scouring the Empire (resources and Force Storm). While the exact contents of this deck tend to vary by player preference, it always comes back to two key heroes: Darth Vader and Emperor Palpatine. While one Sith set in Galactic Ambitions revitalized the Sith mains strategy, the other created a whole new archetype which has been named “Force Hunters.” This deck revolves around a different two-pod core: The Power of the Dark Side and Hunter for Hire. If the dark side chooses to build a wholly-defensive deck, then the only way they’re likely to win quickly is if they can control the Force. Usually this means having more Force icons than their opponent, but in a world where May the Force Be With You exists, that’s not an option. Instead, Emperor Palpatine and Bane Malar opt for a different strategy: kill everything that the light side commits. Hunter For Hire punishes your opponent for winning the Force, while Power of the Dark Side punishes your opponent for losing the Force. Each of these objectives produces free damage on enemy units committed to the Force, allowing you to kill them without spending cards or resources. You’d think that this would cause the light side to simply never commit units to the Force, and often that’s a strategy: until the 4 Echoes of the Force that the deck brings enter the picture. Not only that, but the best objective set on the light side (May the Force Be With You) becomes significantly worse if it’s not committing its units, so if the light side wants to win the game then they need to do it with fewer options and in fewer turns than they would otherwise have. The deck is almost unbeatable for the first few turns of the game, and can accelerate the dial pretty effectively in the early game. But unless it sees some solid units at each key part of the game, it can be difficult to outpace the light side’s growing board as the game progresses. Critically, its free sources of damage (the objectives) can be slow and unreliable, so a smart light side player can manipulate who they commit to the Force and when to minimize the impact of the dark side’s powerful objectives. This slow speed also leaves them open to effective bursts of damage, and without the objective healing effects in Navy and Scum it can be difficult for a Force Hunters deck that falls behind to get back into the game. The deck always starts with Hunter for Hire and Power of the Dark Side, but because it also usually contains Dark Lord of the Sith, it tends to use a lot of the same objective sets that the Mono-Sith (or mostly-mono-Sith) lists field, using this version of Palpatine and splashing in Bane Malar. For those that rely less heavily on Vader, popular additional Scum inclusions are: I Don’t Like You Either (resource, good units, and great edge), Masterful Manipulation (Shadows and Xizor), The Spice Trade (cheap powerful focus manipulation), and The Hutt’s Menagerie (diverse units, plus Rancor). Meanwhile, the most difficult affiliation to effectively pilot had been steadily growing and becoming more and more solved. Just as people were getting the hang of how to win with Scum, they got two huge boosts: Heartless Tactics and I Don’t Like You Either. Both sets gave the faction more good resources, good units, and fantastic removal in a reprint of Captured. That both have strong objectives really reinforced their role as prominent features of the Scum affiliation. Once players got their hands on Heartless Tactics, the affiliation changed. Now it’s very capture-focused, with decks built around using Captured and recurring it or copying it to keep enemy units off the board. What makes Scum so unique, however, is not that it makes use of this capture mechanic: it’s that Scum has incredibly efficient cheap units, particularly ones with blast damage, so even as it disrupts the light side’s board presence it’s still actively advancing itself towards victory. The result is a deck that has the same game plan that the Navy Fortress does, but which goes about it in a wildly different way. Both are decks that seek to disrupt the light side without outright controlling it, keeping them on the back foot just long enough to win the game but not any longer. While Navy does it through superior objectives and defensive edge battles, Scum does it through timely capture effects and cheap aggression. The Scum deck is one that wants to race, because it can prevent enough and supply enough cheap blast that it should win most damage races. Heartless Tactics and The Spice Trade are the core of the deck: the first provides flexibility, damage cancellation, and an incredible removal event while the second gives cheap blast and ways to snowball early aggression into a victory. That the Spice Trade also offers an objective that doesn’t help the light side win the game is also critically important. Other objectives include I Don’t Like You Either (units and resources), The Hutt’s Menagerie (Rancor and protect), The Hunters (Snoova), Lucrative Contracts (Corrupt Officials), Feeding the Pit (resources and Krayt Dragon), The Findsman’s Intuition (draw and Force control), Out of the Mists (good units), “No Disintegrations” (Boba), and Jabba’s Reach (resources and card draw). Occasionally even one copy of Hive of Scum and Villainy is included for a third copy of Captured. There exists a second version of the Scum deck, one which focuses more heavily on Masterful Manipulation. This tends to include The Hunter’s Flight for more cheap ways to capture units out of play, and plays like a more traditional Mains deck that focuses on landing an early Xizor or Dengar and winning edge to keep the opponent’s board locked down long enough to draw into Captures and Boba Fetts. As this deck obviouly can’t include The Spice Trade, it tends to be far less aggressive than the previous deck, though Slave One and Boba Fett are both excellent units at ending the game. When considering what to face in Worlds 2017, these were the archetypes that were at the top of our radars, as the addition of four packs and an FAQ hardly invalidates the top strategies of the previous year. Even if there are now newer and better strategies, there will still be people who prefer to play what they know to something new. Not everyone has time to test all the new cards, and so each of these dramatically different archetypes are still at the top of our radar. If the dark side has a host of diverse and powerful options, the light side proved to have but two: Mono-Jedi (or mostly-mono-Jedi) and Spark of Rebellion. In the top cut of Worlds 2016, over half the field was running some variation on Yoda + Luke, while the rest* preferred to utilize the less consistent but more powerful option of Kanan Jarrus + Zeb Orellios. Yoda and Luke is a combination that’s been effective and popular for years, but Spark of Rebellion was a relative newcomer whose presence at the tournament was far less popular but whose success relative to that popularity was dramatically disproportionate. There were scores of Jedi players, and many of them made the cut. There were only a few Spark of Rebellion players, but most of them did make the cut. This is a big sign that perhaps mono-Jedi’s stranglehold on the light side metagame has come to an end. *There were two homebrew decks that made the top cut, but those were decks that their pilots had mastered in their own niches, and their success hasn’t impacted the larger metagame. Ever since May the Force Be With You and A Hero’s Trial released, this deck has basically existed. You could argue that it even goes back to the Core Set days, with Han, Luke, and the Falcon being the deck’s originators. But now that the Jedi have a host of new strong objective sets to go along with Yoda and Luke, they no longer need to splash the Falcon or Along the Gamor Run to dominate. It’s probably not remarkable to say that Yoda and Luke are the two best objective sets on the light side, but it’s worth remembering why that’s true. May the Force Be With You gives virtually every deck a cheap and resilient source of guns and tactics with an overwhelming ability to stranglehold the Force. Yoda, You Seek Yoda means the little Jedi appears twice as often as other powerful Mains, and whether you’re paying 2 or 3 resources for him, he’s still a unit that should probably cost 4 or 5 given what he brings to the table. That it also comes with a resource and a powerful combat trick means that this pod can be splashed into literally every deck and it will become stronger. A Hero’s Trial, on the other hand, brings the offensive game-ending power to the table. That alone would be enough to make the pod good, but with a cycling Luke’s Lightsaber and a Heat of Battle, the pod is also capable of effectively controlling the board… and what can’t be controlled by damage will be controlled by the two tactics icons of the Speeder Bike. This pod alongside Yoda gives such a strong edge foundation that Speeder Bike is often easily positioned to shut down the opponent’s units and allow for Luke to blow up an objective. Or heaven forbid the Speeder Bike and Obi-Wan end up on the board together (or two Speeder Bikes!) and your opponent’s units may never see the light of day again. Not every deck uses the version of Luke that comes in Between the Shadows, however. Because Shadows Luke doesn’t contain a proper resource, it can be difficult to fit him into an often-expensive deck (his pod on its own is quite expensive). This leads to Jedi decks that either run Core Luke instead (as World Champion Brad Emon did) or to decks which split the difference and include one of each, as Core Luke still comes with a lightsaber and both are good at putting damage on objectives and taking enemy units off the board. While I believe that Shadows Luke is still one of the top 3 light side pod in the game, I recognize that he doesn’t fit into every deck, and you do have to build around him to maximize his pod’s potential. As you can see, there’s a huge amount of space available for a light side deck to customize its build alongside Yoda and Luke. But that was the deck that was known going into 2016. Perhaps more important than the Yoda/Luke strategy is the breakout deck from last November. I’m being mostly facetious with this title, but when facing off against a Spark of Rebellion deck on full-throttle, it often does feel like your opponent is cheating. The reason that Spark of Rebellion is so strong is because it (essentially) has no ceiling. Triggering Spark costs no cards and no resources, so when you can get a 4-cost unit into play off of your deck it’s pretty difficult to lose. This is often not the case; usually you’re getting random 2-drop Children of the Force rather than Kanan or Zeb. But even those are relevant, as are the Freelance Slicers in Zeb’s objective set. A unit that cost you nothing is still a lot even if it’s only got a black gun and a white bomb. I suspect a lot of players didn’t look too deep into building around Spark of Rebellion considered it to be too inconsistent to take to a World Championships, or else they focused so hard on building around the objective that they ended up with a deck that just wasn’t good enough. The trick, as it seems, is to include good cards and just let Spark work when it’s going to work no matter how inconsistently that is. Spark decks start with a certain core: Spark and Zeb provide the free unit fodder with the possibility of going infinite by getting 4-drop mains into play for free. They also are both very aggressive objective sets: Kanan has three white bombs and a Target across three units, while Zeb has three black bombs across two units… and Bo-Rifle can be wielded by either of them for even more bombs, and Well Equipped can refresh them for even more bombs. With all this aggressive power and swarm potential, the next step is obvious: control the board with undercosted tactics icons. That’s where May the Force Be With You and Along the Gamor Run come into play. Not only do these pods all feature tactics icons on units who cost far less than they should, they also provide valuable interactions with Spark of Rebellion: Gamor Run lets you use knowledge of the top of your deck in a new way by letting you know whether to Gamor, or what you’ll need to commit to make the Gamor trigger successful. Meanwhile, if you do peek and see something that isn’t a Spark target (or isn’t a card you want to draw), you can shuffle your deck with Yoda, You Seek Yoda to go try again. Yoda might seem like an odd one to include since it has no Spark targets, but when your deck already has tons of ways to attack towards winning the game, it’s valuable to have a means of slowing down the opponent’s counterattack, or of clearing the way with tactics icons so Zeb doesn’t have to get in a fight with anyone to blow up an objective. The old adage that “every deck is better with Yoda” remains true, as his presence just helps frustrate the dark side enough that they are more likely to let the units you actually care about (Zeb and Kanan) through to win the game. Still, it’s worth pointing out that even beyond getting a shuffle out of the deal, Yoda, You Seek Yoda is working towards successful Spark triggers by removing yet another Spark miss out of the deck. While Luke and Yoda have been dominant forces for a long time, Kanan and Zeb are newcomers that not only have proven that they deserve to be at the World Championships, but have proven that they might even be better than the powerful old standbys. Yet that was all last November. Since then we’ve seen four new Force Packs, and while it’s hard for a single pack to shake up an entire metagame, May the Force Be With You definitely illustrated that it’s possible. So what of the new cards are likely to appear this weekend? Where are the gems that will give this metagame a run for its money? This pack was technically available at Worlds 2016, but wasn’t allowed in the main tournament. That’s probably for the better, as this pod brings a ton of new power and flexibility to light side in general and the Rebel Capital Ship archetype in particular. When you’re just trying to end the game as fast as possible with lots of blast damage, there’s nothing that’s more powerful than ejecting a defender from the engagement before even resolving the edge battle. Couple that with the fact that Wedge is a unit that gives your ships extra blast (granted, he often only affects Red Two), and you’ve got a set that can really make it difficult for your opponent to stop you. When he was first released, he was splashed by himself into an otherwise generic Jedi deck and he was still exceptionally successful. So imagine how he must be when he’s making Home One win edge battles and strike in engagements unopposed. What’s almost more interesting about the Rebel Capital Ship deck that Wedge has revitalized (exemplified by Solidarity of Spirit, Capital Cover, A Legend Begins, Command and Control, and Running the Trench) is not that Wedge is in it, but that Yoda is. Wedge and Solidarity both demand a Rebel Affiliation, meaning that when May the Force Be With You is your only Jedi objective it’s actually somewhat common to not see it at all in a game. This locks you out of playing Jedi cards, but when you consider that the only Jedi cards in the deck are Yoda and Yoda, You Seek Yoda… well one of those becomes an excellent 5-pip edge card and the other becomes the worst card in your deck. But with only two dead cards, the pod can still do a huge amount to help you win edge battles, produce resources faster, slow down the Death Star Dial, and when Dagobah is on the table then you can also play with the most undercosted light side unit in the game. All this while the deck is otherwise slamming powerful Capital Ships and blowing up enemy objectives before the dark side is able to mount a defense. There was a decent amount of Rebel Capital Ships that got played at Worlds 2016, but none of them made the cut. Now with Wedge in the mix, I wouldn’t be surprised to see 1 or 2 make Day Two and be playing on Thursday. In our set review of Hera’s objective set, I gave Hera an A-. I’m stingy with my As, but she’s absolutely earned it. For an objective set that has basically nothing exciting or flashy, it can provide so many solid fundamentals to a deck that they are suddenly free to consider flashier objective sets that might have otherwise been too janky. No matter what ridiculous strategy you have, you need to have resources in your deck and you need units that can fight: either ones with tactics icons to control the board or ones with blast icons to win the game. This pod has all of those things, and on units that are survivable enough that I don’t feel like I’ve spent more resources than they’re worth. On the two extremes are the Phantom and the Ghost. The Ghost is exactly the kind of unit you want to see on turns 2 and later, as the board control is starting to be established and you need to start getting bombs on objectives. It can do 3 damage when unopposed for 4 resources (exactly what I’d expect from a Main) and it’s not terribly edge-dependent. It doesn’t do much to control the board but it’s also 3 Force and elite so it can help you slow down the game enough to get that board control before it swoops in for the kill. And that it has 4 health is surprisingly relevant considering you are going to want survivability to make up for its otherwise poor strike economy, and this ship will get the job done. On the other hand you have the Phantom, a cheap tactics unit that does nothing to advance the game but can do a lot to help slow down your opponent while you set up. While the Ghost wants to move you towards ending the game, the Phantom wants to move your opponent away from ending the game—and it can do that all while passively saying, “You’re not going to kill Luke or Yoda.” If you get the Phantom out with a Guardian, it’s almost impossible for your opponent to stop Luke or Yoda from putting the game away, and when those are two of the best units on the light side… that’s worth a lot for 2 resources. I’d note that since the Ghost has Protect Specter, both ships actually do that job in a Kanan/Zeb deck, making sure that those Specters win when you need them to win. Hera sits somewhere in the middle. She doesn’t protect anyone, and she only has 1 bomb, so she exists in more of a support role which is questionable for 3 cost. But many decks have neutral units (Nudj, Speeder Bike, Wolfmen, Children of the Force, Hired Hands) that benefit from the extra gun and being another elite unit for 3 cost is still quite valuable. Haunting the Empire goes so smoothly into almost every deck that it’s hard to imagine a World Championships without her. Whether she’s more popular in the Jedi lists or the Spark lists remains to be seen, but she’s definitely a permanent addition to the roster! On the Run got a lot of hype when it was first spoiled, because BoShek himself has a pretty crazy text box (Edge 3? Really?). He and his droid are both more than worth their costs, and the ability to recur valuable resource-generating cards with the event is a dream, the set doesn’t have any proper Mains in the way that we think of them. BoShek only has one bomb, so he’s not going to end the game for you quickly, and he only has two guns and no tactics, so he’s unlikely to generate strike advantages by preventing your opponent’s units from striking. The droid has a bomb which is nice, but again it’s only one so it can only do so much on its own. And while the whole set has plenty of tricks (and anti-tricks), it lacks fundamentals. In fact, you could easily argue that BoShek is like the anti-Hera—while Hera’s pod is all about giving you good combat units for your cost that improve your survivability and strike economy, BoShek is a pod that features no strike advantage, limited blast, and really only exists to support the rest of your deck and deny your opponent’s ability to resolve tricks. Support pods are notoriously tricky to build around, which means that BoShek exists in a difficult space. Fortunately, there is already a top-tier deck that’s perfectly suited to receive him. Falcon-Jedi, the Yoda/Luke deck that splashes Smugglers for Asteroid Sanctuary and Along the Gamor Run, wants literally every card in this objective set. Luke and the Falcon are expensive objective sets, so having two resources (and a way to get a third) is valuable. Yoda and Luke (and Falcon) already fulfill your need for high-impact units for BoShek to support, so you’re not weighing too heavily on him. All three of those heavy-hitters are ones that create great strike economy (assuming Luke has a lightsaber, all three have 3+ guns, and Yoda has a tactics), so if BoShek fights alongside them then his edge 3 will be making them better rather than relying on his own meager icon spread. And since he’s elite, he’s more than happy to commit with May the Force Be With You and resurrect those Wolfmen. I don’t know that I’m expecting to see much of BoShek this weekend, given that he needs an existing architecture to support (though a deck with Dodonna and Hera is on the table for Store Championships), but I’ll be shocked if I get paired up against a Falcon-Jedi deck that doesn’t have BoShek in it. For the longest time, Sith decks have been dominated by two characters: Darth Vader and Emperor Palpatine. In the deluxes and cycles leading up to this point, the seeds have been planted for this new deck, but it took this objective set to make everything fall into place: the Sith Creatures deck. Now, the most common Sith characters you’re likely to keep hearing about are Gorc and Pic. Brothers of the Sith, Threat From the Depths, Hunters of the Jedi, Dark Lord of the Sith, Fearsome and Foul, and The Killing Cold are the entirety of the deck, which plays lots of big (and little) creatures with lots of black guns with the intent of creating a wall of damage so dangerous your opponent can’t, or won’t, attack into it. That the deck works at all is actually fairly surprising, as it lacks a lot of the usual suspects of a dark side deck: it has virtually no blast damage, it has minimal tactics, and it often doesn’t even care much whether it wins or loses edge (though with a Twist and Brothers of the Sith, it can win edge battles a bunch too). The deck is flush with nonlimited resources from Threat From the Depths, Hunters of the Jedi, and Dark Lord of the Sith, meaning it can almost always play what it needs to play, even as it often doesn’t need to: Hunters of the Jedi and Threat From the Depths are very consistent ways to put your Terentateks into play for free. Even if they get sacrificed to the Depths, you can always get them back with Endless Hunger when your opponent inevitably attacks into you. This means that it’s very common for the deck to have 2 or more Terentateks in play, and since they have three black guns and two health it’s almost impossible to keep light side units on the board once they enter an engagement. There are very few decks that can win when every single one of their units can only resolve a single strike before it dies. And I haven’t even mentioned the craziness that is Icetromper + Feeding Frenzy. How does one defeat this deck? It has “free” Terentateks in abundance, it has Dark Lord of the Sith to buy time, it almost always has 6 or more cards to defend with thanks to Brothers of the Sith, and it can even start getting proactive once it eventually finds Telepathic Connection and can start attacking with Gorc and Pic. Almost every unit that attacks is guaranteed to be dead by the end of the engagement unless you have a lot of tactics, which will often lead to games where neither player attacks and the boards just build up more and more and get more and more complicated until the dial eventually reaches 12 and the dark side wins. To date I’ve not effectively figured out a deck that could beat this outside of some Jedi Leia build that would get utterly steamrolled by a proactive Scum or Sith deck. The only weakness that I’ve discovered in the Creature deck is actually kind of bizarre and quirky: the deck has no way to win the game. What the Sith Creatures are good at is building up a wall so that they cannot lose the game. But what they don’t have is a way to actively win the game. They have virtually no bombs (I think it’s just Gorc, Vader, and Sith Wyrms? ), so they can’t destroy objectives, but they also can’t advance the Force, because while Vader and Gorc can usually take the Force back on the dark side’s turn, they almost never hold it through the end of the light side’s turn. This leads to games that go on for well over an hour as both players attempt to puzzle out the increasingly complex board state. In a tournament setting, this is horrible as running out of time is (almost) as bad as losing. If I get paired up against a Sith Creatures deck at any point, I’m going to be very worried because I still don’t actually know how I would go about defeating it. But I’m also hoping that a deck this slow takes so long to play that very few people actually want to bring it to the tournament. Dengar did more to solidify Scum’s place at the top tables than probably any other objective set Scum has seen. But Jabba offers a different direction for the archetype than was present in Worlds 2016. While decks previously relied heavily on using capture effects to keep the board mostly clear while Energy Spiders, Ponda Baba, and Dengars attacked into enemy objectives, Jabba prefers to sit back with two black tactics icons and think about things more. His High Exaltedness prefers a more reactionary approach than the previous takes on Scum, because a lot of the value in his pod comes from his ability to essentially generate 4 resources a turn: 2 on your turn and 2 on your opponents. The trick, of course, is that you only get the virtual resources on your opponent’s turn if you actually have events to play. This is where this new archetype emerges. Instead of relying on lots of units with a few tricks to keep your opponent off-balance as was the previous Scum strategy, Jabba prefers to have fewer units and more tricks. Thanks to Jabba, his objective, and his Twi’lek advisor, you’re very heavily incentivized to fill your deck with lots of Scum events. Captured is an obvious one, but perhaps less obvious are events like A Price on their Heads, He Doesn’t Like You, Jabba’s Summons, Pay Out, Sonic Detonation, or heaven forbid: Threat Removal. That the set comes with Hutt’s Hospitality also helps control the board, which is what the deck needs to do while you’re busy playing good Bounty Hunters with Jabba’s discount until you can just end the game. I’m not sure how much of Jabba I expect to see, but he seems to be popular among Scum players simply because Jabba himself is so potent. We found it to have a few weaknesses that made it less appealing, namely that Death Mark and Freelance Hunter are usually just bad cards, but in those games where Jabba the Hutt hits the table early, I wouldn’t be surprised if he ran away with the game. Jabba introduces a different, more reactive archetype for Scum which is a nice twist to differentiate the affiliation that’s finally growing to reach a comfortable diversity like its predecessor in Sith. I didn’t believe it when I saw it either, but the Death Star is a real unit that exists in this game. If I can get it onto the table (and that’s a big if), it should be able to pretty effectively float over and blow up an objective and a unit each turn, which only needs to last a couple turns before it’s game over. But the thing costs twelve resources! If we just assume I’m not playing it, because that’s a lot of money, what else does the pod bring? Two blast chuds and four resources. And then all those little Death Star Engineers that were making you money can turn into game-winners when they charge into your opponents objectives and nuke them all. It’s all about ramping into giant ships and then using those ships to shut down as much from your opponent as possible. It does a lot of really bizarre things, such as attack with small blast resources, nuke objectives with the Executor and Chimaera, win crazy edge battles on the back of 2x Twist, 2x Death Star, and generally gum up the board with tactics icons on Gladiators and Grand Moff Tarkin. You’ll notice a distinct lack of Enforced Loyalty in this deck, and that’s intentional: there’s no space for Officers in a deck with Death Star Engineers, and when you’re trying to build a more proactive ramp strategy, there’s no time to feverishly protect your Enforced Loyalty. The pod is bad for edge and while it can do great things by reflecting damage, it can also be difficult to time those reflections against a skilled opponent. The Death Star turns the Navy Fortress into the Navy Shipyard, and wants to go from being an entrenched bulwark into an unstoppable juggernaut. Will this deck be at Worlds? I don’t know. I’m sure the Death Star will be, because it’s so new and shiny, but it’s also a very strange objective set so I don’t know what people will come up with. There may be different excellent Death Star decks that people produce, or there might be more Fortress decks with the Death Star awkwardly jammed in. We shall have to see. While there were some excellent objective sets that came out in the past six months, they were not the only shakeup. A month ago, we also received an FAQ that altered what some objectives did, and broke up an offending combo that allowed for absurd game states. Unlike the new objective sets, I believe this FAQ will have minimal impact on the decklists people choose to bring, though they will have an overall effect of weakening the respective archetypes that those objective sets are found in. The biggest errata was to Enforced Loyalty, which no longer hits each of your opponent’s objectives. This is a very dramatic nerf that weakens the power of the card: rather than automatically winning you the game after three activations, it will now only help you generate minor free advantages and thus become a lower priority for the opponent. As a side-effect, you can now have two of them out (there’s no longer a “Limit 1” on the effect), but because the Navy Fortress’s go-to means of winning the game without having to attack is gone, it means they’re going to have to play a more traditional game than just sit on their high horse and defend indefinitely. I believe people will still play the objective set in their decks because of Yularen and Fist, and that’s a perfectly acceptable strategy. To me, this is the final straw that would drive me away from a Navy Fortress deck (and towards a Death Star deck, frankly) as the low edge and passive nature of the set doesn’t inspire confidence. I’m glad the “non-games” that Enforced Loyalty could produce are gone, but that it’s still an effect that matters, since it can be used with a sculpting attack to still take out the critical objective (Spark?) earlier than otherwise possible. The other objective nerfs were, surprisingly, to new objectives with the purpose of preventing negative play experiences. Shortly after Jabba came out, it was discovered that building around Jabba, Feeding the Pit, and the Spice Trade could create games in which the dark side played some early bombs and could attack with their Krayt Dragon or Energy Spider several times in the same conflict phase, using Jabba’s objective to return Spice Visions and Spice Blitz every time an enemy objective was destroyed to continue the assault. This allowed the Scum deck to win games by turn 3 surprisingly consistently, and even when the pieces didn’t all come together, the objective would get back Captured to keep the light side’s board clear anyway so they still wouldn’t be able to get back into the game. Neither His High Exaltedness’s nor Threat From the Depths’s nerf fundamentally change how the decks play: Sith Creatures will just keep doing what it’s doing with the added cost, while the degenerate Jabba deck was broken up to return Scum to a more balanced status-quo in which Jabba can continue to Capture units after objectives are destroyed, but only as a catchup mechanic, rather than a snowball one. Nobody likes a snowball mechanic. In addition to nerfing three dark side objectives, there were two restrictions added to the light side of the Force: The Last Warrior and Against All Odds (to minimize the frequency of tournament disqualifications caused by the Last Warrior and Shifty Lookout) and Spark of Rebellion and Heroes and Legends (to break up the Rahn’s Guidance/Spark of Rebellion combo). The first is largely irrelevant here: it does make the Spark deck weaker as Against All Odds is a fantastic objective for a swarm deck, but it was a 10th-pod in a deck that is more than capable of finding a single replacement. Spark of Rebellion, on the other hand, was not addressed in any significant way. This may not be obvious, given the fact that a) the dark side is consistently stronger and more diverse than the light side and b) it was addressed in breaking up a ridiculous combo. But while breaking up Rahn’s Guidance and Spark of Rebellion was important, as stacking the deck and getting free Zebs and Kanans was not acceptable, the Spark of Rebellion objective remains intact from its original manifestation. There might be fewer Zebs and Kanans coming off the objective, but it’s still possible, and most of the time such a flop will win the game (or at least advance the light side to a very dominant position). It’s telling to me that this is the case, and makes me think that it was intentional. Probably it’s because the dark side has the upper hand, and so taking away one of the only options the light side has that isn’t named Yoda or Luke would be demoralizing to people that don’t just want to play with those two all the time. But comparing it to Threat From the Depths, we notice a pretty incredible contrast: Threat From the Depths went from having a decent/low cost to get your free unit (costs you a card in hand and the unit only lasts until the end of the phase) to having a more balanced cost: it also costs a resource and has a built-in limit. Compare this to Spark of Rebellion, which had even fewer costs than Threat From the Depths to start with (it costs you no resources, no cards, and is only really limited by what’s on top of your deck) and didn’t get touched at all. It’s clearly intentional that Spark is supposed to be much stronger than Threat From the Depths, yet the developers decided that getting free units on the light side is more okay than getting less-free units on the dark side. Why is that, and what does that favoritism have on the metagame? As I said, I believe it ultimately comes down to the fact that Yoda and Luke are so much fundamentally stronger than most other light side options that without Spark, there would only be one deck. By empowering another objective set, maybe there will be more diversity on the light side than there used to be. I think that may very well be the case. And yet as I was playing against Spark, I had all the same negative play experience that I had when playing against Threat From the Depths. Nothing should be free in this game, not even if it’s inconsistent. How do you fight against a deck that gets to start their first conflict phase with Luke and Kanan on the board, and all you got were a couple 2-cost chuds? We’ll see how the metagame shakes out this weekend, but after testing I believe that, while the dark side is the stronger side on the whole, the best deck in the game has 2 copies of Spark of Rebellion and 2 copies of May the Force Be With You. Perhaps it was how few options were available, but building a light side deck was fairly easy. Building a dark side deck—one that could consistently beat Spark of Rebellion—that was much more difficult. Every time I build a deck that should have been good, it would do its strategy and do it well, and at least half the time the Spark deck would just drop in something big, or something timely, and suddenly all my tactics are blanked by Outer Rim Mystic, or I can’t kill Yoda through the Guardian, or there’s a Zeb with a Bo-Rifle that cost them only 1 resource (and zero cards) to play. Even if I have the Deadly Sight, is it really fair that I have to spend 3 resources and a card to kill something that my opponent got for zero? As a professed diehard fan of Attack Pattern Delta, which I don’t consider unfair and which few people I know consider unfair, I had to figure out why Spark was so broken and APD wasn’t. Obviously part of it is that you can get 4-drops from Spark, but that’s not the whole story. APD would be just as broken if it had support, but it doesn’t—there are very few objective sets with 2 cheap Vehicles, and they don’t really synergize with each other. APD cares about Speeders, Rogue Squadron X-Wings care about Fighters and Pilots, Alliance B-Wings are just cheap bombs, B-Wings are super edge-dependent in a low-edge deck, and the Renegade Squadron Escorts and Skipray Blastboats are both in another affiliation and just full of awkward cards in a vehicle rush deck. Compare to Spark, which not only has a lot more targets (because there are tons of objective sets with 2 or more Characters), but its targets are usually higher-impact. The Character sets tend to have much better edge than the Vehicle sets, and when you’re not getting Rogue Squadron X-Wings, you’re getting Y-Wings and Snowspeeders with only 1 health, while the Character decks are getting Guardians of Peace, Outer Rim Mystics, and Freelance Slicers—all of which are as good as their vehicle counterparts in combat but which also have hugely beneficial text. The Characters are often supporting powerful mains (Dodonna’s chuds have Dodonna, Twi’lek Loyalists have Luke), while the Vehicles are usually just in an objective set all on their own. All this adds up to mean that while APD could be broken, it’s not because to make it work you need to run lots of awkward non-synergistic objective sets. Spark can go in most Character decks and just work flawlessly. Not to mention the free 4-drops. As Spark is the best deck in the game, I expect to see it a lot. While I’m still concerned about going up against a Death Star Navy, a Sith Creatures, or a Scum Aggro deck (what I believe to be the best decks in each affiliation), none of them hold a candle to the Spark deck, which I believe is THE deck to beat in the format right now, because I believe it is the best deck in the game. Good luck to the competitors today and tomorrow… and May the Best Spark Win!